February 22, 2014 – Over four hundred people rallied today in San Francisco’s Civic Center/UN Plaza to celebrate the removal of Ukraine’s President Yanukovych and to mourn and honor the brave hundred Ukrainians who gave their lives to stand up against a corrupt regime. After three months of struggle, Ukraine’s opposition movement appears to have achieved its goal of removing the discredited regime of President Viktor Yanukovych. Today, Ukraine’s Parliament voted to impeach the President and set early Presidential elections to be held on May 25, 2014. The protests in Ukraine, which began in November 2013, were initiated after President Yanukovych refused to sign a European Union Association agreement. The agreement would have required political and economic reforms that the Yanukovych regime was unwilling to implement. Instead, Yanukovych entered into a deal that would have kept Ukraine under Russia’s political and economic yoke for the foreseeable future. The regime’s brutal response to what were initially peaceful protests only served to strengthen the opposition’s determination to fight for a brighter future for Ukraine, one in which democracy and economic opportunity reign rather than corrupt oligarchs. Today’s victory came at a high price of more than a hundred dead and thousands injured. “It pains me that it took so much suffering and loss of life to get rid of the unscrupulous Yanukovych regime” said Mikola Bilogorskiy, the organizer of today’s rally. “I have been lucky to enjoy freedom and economic opportunity here in the United States, and I will continue to do whatever I can to ensure that my family and friends in Ukraine have a chance to do the same without having to leave their country”. The organizers of today’s event also expressed gratitude to US and European leaders for their support of democracy in Ukraine. Pressure from the international community and assistance with negotiations have been essential to the progress that has been made in Ukraine. This demonstration was not sponsored by nor affiliated with any governmental or non-governmental organizations, political groups, or parties. Livestream Video (Ostap Korkuna): opening with Ukraine’s national anthem; mourning the victims;demonstrators’ address to President Obama and the US Government. 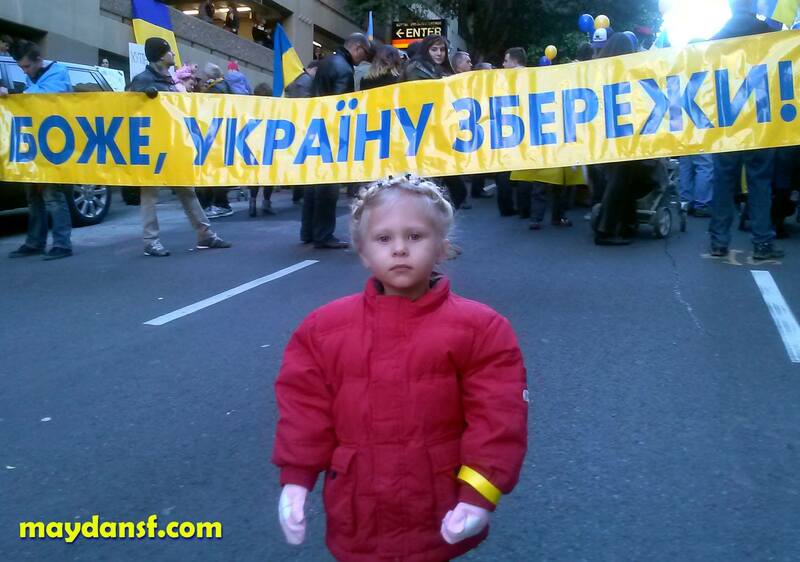 Hundreds of Ukrainians rallied Sunday in front of the German Consulate in San Francisco. San Francisco, CA – January 27th, 2014 – The Ukrainian communities of the San Francisco Bay Area and Sacramento held a demonstration on Sunday, January 26th in front of the German Consulate General in San Francisco. The people rallied to ask U.S. and European leaders, more specifically Angela Merkel, to take action to support pro-European movements in Ukraine, and put an end to the violence that has resulted in multiple deaths, and hundreds of injuries in Ukraine’s capital Kyiv last week. The San Francisco demonstration was coordinated with more than ten similar demonstrations in major cities around the United States and Canada, including Washington DC, Chicago, Sacramento, New York, and Quebec. The video of the San Francisco protest was streamed live to screens in Independence Square in Kyiv, and was started by the simultaneous singing of Ukraine’s national anthem by people in both places. About $5,000 was donated to support the protesters in Kyiv, who have been braving freezing conditions since November of last year. Over 400 signatures were collected on a letter to be sent to the President of the United States, California senators, and members of the House of Representatives. The demonstrations in Kyiv, which have attracted hundreds of thousands of people, began in November 2013 after president Victor Yanukovych shelved the signing of an agreement to deepen ties with the European Union, instead choosing to focus on Russia, which worked aggressively to derail the EU deal. The peaceful protests took an unexpected turn after the “Berkut” special police forces used tear gas, truncheons, and flash grenades against protesters. The political conflict in Ukraine has intensified since January 16th, when the Party of Regions parliamentary faction, controlled by President Victor Yanukovych, violated multiple procedural rules and voted through a set of laws that criminalized any criticism of the government and its officials, and made fair elections nearly impossible. The draconian laws are a blatant import from neighboring Russia, albeit with more severely defined punishments, and are designed to suppress any opposition against the corrupt Yanukovych regime. Ukrainian community of Silicon Valley protests Yanukovych’s decision to turn away from Europe and the crackdown on protesters in Kyiv. Hundreds of Ukrainians rallied Sunday in front of the Ukrainian Consulate General in San Francisco. San Francisco, CA – December 9th, 2013 – Wrapped in Ukrainian flags and dressed in blue and yellow, between 400-500 Ukrainians from the San Francisco Bay Area and Sacramento gathered outside the Ukrainian Consulate on Sunday to show their support and solidarity with the ongoing anti-government demonstrations in Ukraine. The demonstrations in Kyiv, Ukraine which have attracted hundreds of thousands of people, began a few weeks ago after president Victor Yanukovych shelved the signing of an agreement to deepen ties with the European Union, instead choosing to focus on Russia, which worked aggressively to derail the EU deal. The protests took an unexpected turn last week after the “Berkut” special police forces used tear gas, truncheons, and flash grenades against protesters. The San Francisco demonstration was coordinated with more than ten similar demonstrations in major cities around the United States and Canada. The video of the San Francisco protest was streamed live to large screens in Independence Square in Kyiv, and started by the simultaneous singing of Ukraine’s national anthem by people in both places ( http://www.youtube.com/watch?v=zZVAl7FEWdQ ). Ukrainian-American protesters shouted slogans in both Ukrainian and English “Ukraine is Europe!”, “USA supports Ukraine”, and held up signs that read “Ukrainian Americans support pro-European choice of Ukrainian people” and “San Francisco stands with Ukraine.” The protesters started out with a Ukraine’s national anthem and sang several other popular Ukrainian songs throughout the event. People took turns in front of the microphone to share their heartbreaking stories about their family members back home being persecuted by the current regime. Also, $2,000 was donated to support the protesters in Kyiv, who are braving near-freezing conditions. “We organized the Ukrainian diaspora of California to show our support to the homeland and demonstrate the active citizenship of Ukrainians here”, said Oksana Ponomarenko, one of the organizers of the demonstration. Show outrage with the brutality of Berkut, special units of the Ukrainian police force, which harshly beat protesting civilians on November 30, 2013. Impeachment of the President of Ukraine Victor Yanukovych; a peaceful withdrawal of the current ineffective and corrupt Ukrainian Government, and the call for early Presidential Elections in Ukraine. A Pro-European path for Ukraine: we believe that a long-term integration of Ukraine with the European Union will result in a much better future for the country. Publicly express a stronger public position against the President of Ukraine Victor Yanukovych and the actions of the Cabinet of the Ministers of Ukraine. Make a clear public statement about President Obama’s position at a global press conference in the White House with regard to Ukraine, and Putin’s recent interference. Issue a joint statement with the Chancellor of Germany Angela Merkel, the Prime Minister of the United Kingdom David Cameron, and the President of France Francois Hollande with regards to the situation in Ukraine, and Putin’s interference. Impose economic sanctions against the President of Ukraine Victor Yanukovych, blocking his and his family’s bank accounts. The demonstration finished by the inspiring Paul McCartney song “Let It Be”. Сотні українців зібралися на мітинг в неділю перед будівлею Генерального Консульства України в Сан Франциско. Сан Франциско, Каліфорнія, 09 грудня 2013 року – Під українськими прапорами, вдягнені у синьо-жовті кольори, близько 400-500 українців з центральної Каліфорнії та Сакраменто зібралися в неділю перед будівлею Генерального Консульства України, щоб висловити підтримку та солідарність з антиурядовими демонстраціями, що проходять в Україні. Демонстрації у столиці України, Києві, які зібрали сотні тисяч людей, розпочалися декілька тижнів тому після того, як президент України Віктор Янукович відмінив підписання угоди асоціації України з Європейським Союзом і обрав курс на зближення з Росією, яка агресивно підривала план підписання угоди з ЄС. Протести прийняли неочікуваний поворот, колі минулого тижня спецпідрозділ “Беркут” застосував сльозогінний газ, кийки та світлошумові гранати проти протестувальників. Демонстрація у Сан Франциско координувалася з понад десятьма іншими подібними заходами в найбільших містах Сполучених Штатів Америки (США) та Канади. На великий екран, розташований на Майдані Незалежності в Києві, велася пряма трансляція мітингу в Сан Франциско. Розпочалася вона спільним виконанням національного гімну України учасниками обох мітингів (http://www.youtube.com/watch?v=zZVAl7FEWdQ). Українсько-американські протестувальники скандували гасла українською та англійською мовами “Україна – це Європа!”, “США підтримує Україну!” та тримали плакати з написами “Українські американці підтримують проєвропейський вибір українського народу” та “Сан Франциско разом з Україною”. Окрім українського національного гімну протестувальники заспівали ще й інші популярні українські пісні. Люди по черзі виступили перед мікрофоном і поділилися сумними історіями про своїх родичів в Україні, яких переслідує нинішній режим. Також, було зібрано 2 тис. доларів США на підтримку протестувальників у Києві, які, не зважаючи на холод, хоробро відстоюють свою позицію. “Ми організували українську діаспору Каліфорнії, щоб показати нашу підтримку Батьківщині та продемонструвати активність громадян України тут”, сказала Оксана Пономаренко, одна з організаторів демонстрації. Інший організатор Микола Білогорський поділився: “Я родом з Харкова, і мій батько зараз знаходиться на Харківському Євромайдані. Цим заходом я хотів показати єдність Сходу й Заходу, України та США проти корупції та насильства й заради демократії та свободи”. Виказати обурення жорстокістю членів спецпідрозділу «Беркут», які жорстоко побили мирних протестувальників 30 листопада 2013. Імпічмент Президента України Віктора Януковича; мирне повалення діючого неефективного й корумпованого Уряду України; заклик до дострокових Президентських виборів в Україні. Проєвропейський шлях розвитку України: Ми вважаємо, що довгострокова інтеграція України з Європейським Союзом призведе до кращого майбутнього країни. Публічно висловити сильну громадську позицію проти Президента України Віктора Януковича та дій Кабінету Міністрів України. Зробити чітку публічну заяву щодо позиції Президента Обами на глобальній прес-конференції у Білому Домі щодо України та нещодавніх втручань Президента Російської Федерації Володимира Путіна. Представити спільну заяву Канцлера Німеччини Ангели Меркель, Прем’єр-Міністра Великобританії Девіда Кемерона та Президента Франції Франсуа Олланда щодо ситуації в Україні та втручань Президента Російської Федерації Володимира Путіна. Ввести економічні санкції проти Президента України Віктора Януковича, заблокувавши банківські рахунки його та його родини. Демонстрація завершилася під пісню Пола МакКартні “Let it be”.